The Breast Cancer Research Laboratory (BCRL) at the Fox Chase Cancer Center in Philadelphia, PA, directed by Jose Russo, MD, has the mission of understanding the cellular and molecular basis of breast cancer as well as developing translational tools relevant for the treatment and prevention of the disease. Being a cancer research laboratory, the BCRL is accustomed to immunohistochemistry (IHC) and multiplex IHC to analyze, confirm and learn about the myriad of interactions within a cancer cell. The laboratory has traditionally conducted specialized histological stains manually. However, due to high volume workload, the lab began facing problems and challenges in maintaining stain consistency, workflow and throughput. To to free highly-skilled research associates and technicians for more demanding tasks, the BCRL pursued alternative avenues of histology and decided that automation was its best option. The laboratory team opted to invest in the BioGenex automated i6000 Infinity stainer, a user-friendly system with easy-to-use open software, to handle the dynamic needs and heavy staining volume of the BCRL. With a Ph.D. in immunology, Yanrong Su is a research associate scientist at the BCRL with over 15 years of cancer research experience. She has extensive knowledge and practice in immunohistochemistry, immunofluorescence and in situ hybridization of various tissue and cell types. A customer of BioGenex for over three years, Dr. Su has been using the i6000 primarily for IHC and has stained thousands of slides consistently with reliable results. “It is a great instrument not only because it saves time but it also gives reliable and consistent staining results,” said Dr. Su when asked to comment on her experience with the i6000. With the automation offered by the i6000 Infinity stainer, the BCRL was able to allocate resources away from manual staining and increase throughput dramatically. Now she and the rest of her research team are able to focus more on other critical tasks for their projects and less time on staining slides. When making the transition to an automated staining system, BCRL learned that they did not have to give up many of the reagents the lab has grown to rely on, especially that of BioGenex’s Super Sensitive Polymer-HRP Detection System. “It is really sensitive and the background is very clean,” said Dr. Su. She and the rest of her team at BCRL were delighted to learn that many of the reagents they had used and become accustomed to were easily swapped into the i6000 stainer. 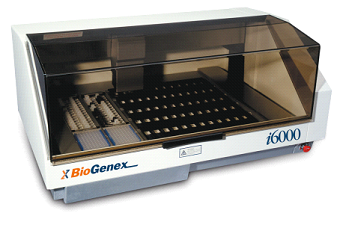 The service does not end with the sales of the i6000 Infinity stainer or any other of BioGenex’s products and reagents. “The customer service of BioGenex is very good. Whenever I have questions, I can always reach their customer support department by phone and have the problem solved. The field representative is also very responsible for all of my requests, such as the reagents that I need, and helpful in setting up a new program when I want to try a new method [on the i6000],” said Dr. Su. BioGenex takes customer service seriously and is proud of providing high-quality products and superior after-sales support and customer service. If there is ever an issue with any of the products we supply, BioGenex is committed to remedying the problem in the most prompt, efficient and friendly way possible. Today, when using the i6000, Dr. Su and the rest of her team in the BCRL at Fox Chase Center are able to perform high-quality, high-throughput staining on 60 slides in 8 hours! Here at BioGenex, we are happy to hear that customers such as Dr. Su have been benefitting from our products and look forward to serving them in the years to come.